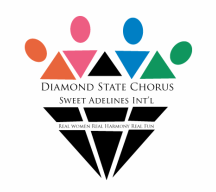 The Diamond State Chorus was chartered on December 7, 1978 as a result of the consolidation of Wilmington's Blue Hen Chapter and Newark's Colonial Triangle Chapter. As of 2014, there are three charter members still singing with this chapter - Marilyn Ferguson, Pamela Nichols and Claire Pratzner. Membership has been as many as 60 and as low as 20. According to Pam Nichols, our small size hasn't stopped us from growing and developing.